The Romanian presence at the London Book Fair, now in its 9th year, is a celebration of the vitality and richness of Romania’s literary scene through a kaleidoscopic programme that unfolds at our stand at Olympia Exhibition Centre as well as at the Romanian Cultural Institute (1 Belgrave Square) and Waterstones Bookshop on Piccadilly. Three days of book launches, dialogues, exhibitions and concerts are anchored by two special events dedicated to Mircea Eliade and Mihail Sebastian, two of the most extraordinary figures of Romanian letters, who have been returned to English bookshelves with new, brilliant works waiting to be discovered. As in the previous years, our programme also showcases the newest crop of translations from Romanian literature, featuring an aesthetically diverse ensemble of remarkable authors. Our guests of the Romanian programme in 2016 are: writers and academics Sorin Alexandrescu, Andrei Cornea, Bryan Rennie and Florin Ṭurcanu, authors Ruxandra Cesereanu and Dumitru Ṭepeneag, author and translator Philip Ó Ceallaigh, translators Alistair Ian Blyth and Christopher Moncrieff, editors Casiana Ioniţă, Susan Curtis Kojakovic and Ramona Mitrică, as well as publisher John O'Brien. Music will be performed by the Forna Quartet. Full biographies here. The Romanian participation at the LBF 2016 is organised by the Romanian Cultural Institute's National Book Centre and the Romanian Cultural Institute in London, with the support of the Romanian Embassy, Waterstones Piccadilly, the Romanian Publishers Association, Istros Books, Penguin Books and Profusion Books. The project is funded by the Romanian Cultural Institute. The opening event at Romania’s stand at Olympia Exhibition Centre brings together Romanian and British authors, publishers and other professionals from both sides of the English Channel. Opening remarks will be given by Dorian Branea, the director of Romanian Cultural Institute in London, Cosmin Onisii, Chargé d’affaires of the Embassy of Romania in London, and Bogdan Popescu, the director of Romanian Cultural Institute’s National Book Centre. Followed by a vin d’honneur. The stand was designed by Romanian graphic artist Zoe Olaru. The latest Romanian books in English are presented in a special event hosted by Waterstones Piccadilly, the flagship London bookshop and the biggest bookstore in Europe. The event brings together authors Ruxandra Cesereanu (‘Angelus’, Lavender Ink) and Dumitru Ṭepeneag (‘The Bulgarian Truck’, Dalkey Archive Press), translator Alistair Ian Blyth, editors Susan Curtis Kojakovic (Mircea Eliade, ‘Diary of a Short-Sighted Adolescent’, Istros Books) and Ramona Mitrică (Augustin Buzura, ‘Report on the State of Loneliness’, Profusion Books), as well as publisher John O'Brien, the founder of Dalkey Archive Press. Tickets: £5 (redeemable against purchase of one of the books on the evening). Available in store, by telephone: 020 7851 2400 or by email: piccadilly@waterstones.com. One of the greatest names of Romanian culture and a seminal historian of religions, Mircea Eliade is this year’s focus of the Romanian programme at the London Book Fair. Original and encyclopaedic, considered as a Renaissance-like character in the range of his scientific and artistic ambitions, the great writer was one of the most influential academics and literary figures in interwar Romania before becoming the revered international scholar and mentor. To mark the English publication of Eliade’s first novel, ‘Diary of a Short-Sighted Adolescent’ by Istros Books, Professors Sorin Alexandrescu, Florin Țurcanu and Bryan Rennie together with translator Christopher Moncrieff and editor Susan Curtis-Kojakovic meditate on the cultural legacy and contemporary relevance of the legendary author. Free entry. Please book on Eventbrite if you wish to attend. Set up in the RCI Gallery, the exhibition follows, through a collage of old photographs, books, and emblematic excerpts, the life and work of the great author and scholar. 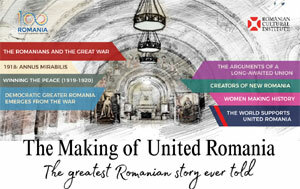 The exhibition is realised in collaboration with the National Museum of Romanian Literature. The discussion will be followed by a concert offered by Forna Quartet, presenting a selection from the classical repertoire of Sebastian’s most beloved pieces.